Food outlets open and close so often nowadays in Kota Kemuning that it’s not surprising the residents can’t really keep up with the dynamics. In the town center, what used to house a Pan Mee restaurant has now given way to Kampar Old Town Kopitiam. 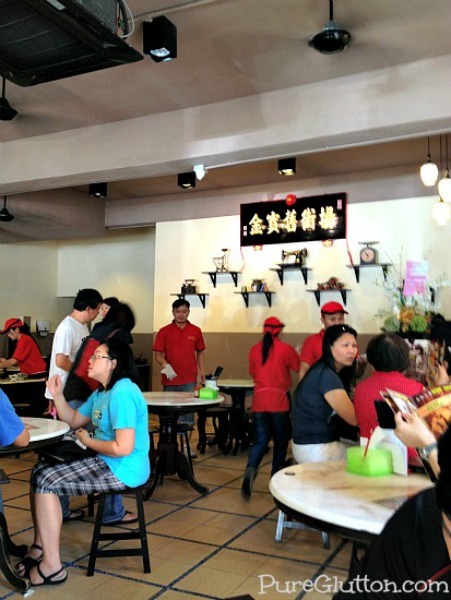 This kopitiam is run by the family of Leong Kok Ying who is the founder of the famous Restaurant Wing Lok Yuen in Kampar. 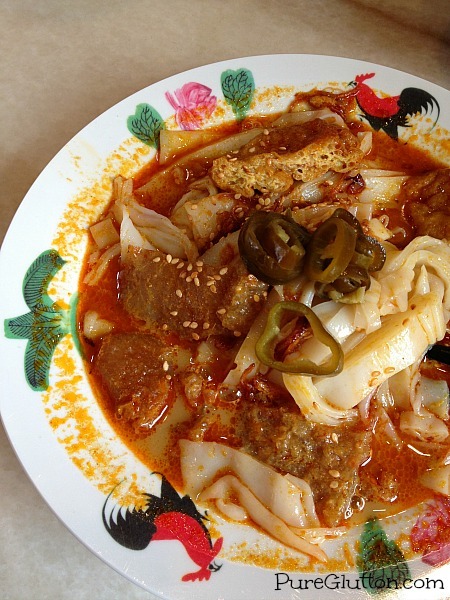 Located along Kampar town’s main street – Jalan Idris, that restaurant was founded in 1947. Wing Lok Yuen is the original purveyor of the famous Kampar chicken biscuits, kaya puffs, siew paos and eggy sponge cakes. I’m glad I checked this place out as I discovered they serve Chee Cheong Fun here very much the Kampar style, and very close to the Ipoh version which I so love. Although the chee cheong fun may not be as smooth as those we get in Kampar or Ipoh, they are still commendable. But best of all, it’s served with the typical red sweet sauce that I am so used to, back in Ipoh. 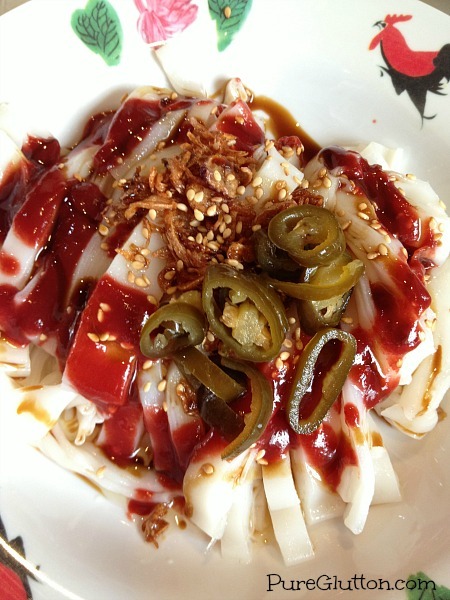 A plate of plain chee cheong fun with shallot oil, soya sauce, red sweet sauce and pickled green chillies by the side costs only RM3! This is how people from Ipoh eat their chee cheong fun – plain, simple, heartwarming. When I moved to KL, it took me a long time to understand and accept the KL-style of chee cheong fun which is smothered with all kinds of yong taufu! 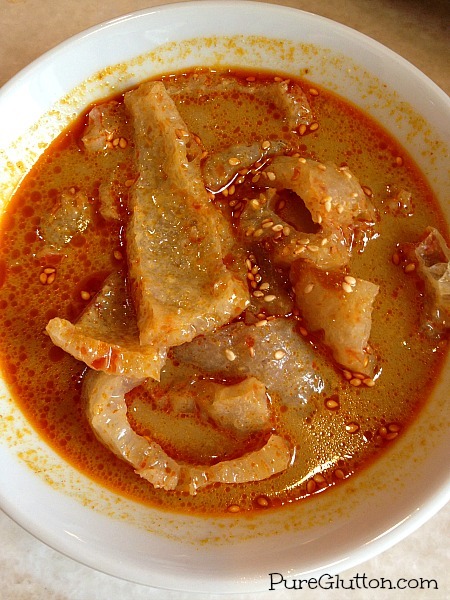 Then there’s the “special” version – served with curry pork skin! Oh bliss! Curry pork skin is such comfort food for me as outside of Ipoh, this dish is quite difficult to come by. The pork skin used here is specially supplied all the way from Kampar where the quality is much better – the pork skin is thicker and denser in texture, with a good bite unlike the ones available here in the Klang Valley which are thinner and more porous. Additional portions of these delectable curry pork skins are available at RM3 – a price which I gladly pay. 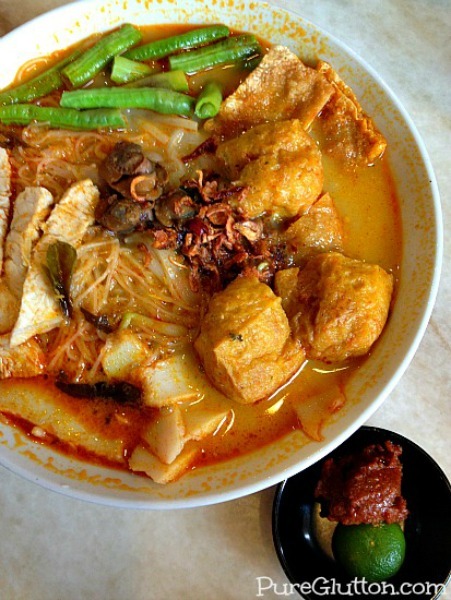 The Curry Laksa (RM6.80) is served with fish cake, sliced pork, beancurd skins, long beans, beancurd puffs and cockles. The curries here are cooked using milk instead of coconut milk. This, according to owner, Anson Leong, is to pander to the healthy trend among diners. So, while the curries lack that rich nutty aroma typical of coconut milk, it makes up with a milder healthier take so diners can actually slurp up the entire bowl without worry. Personally I find it still very tasty as the spices used in the curries are sufficiently aromatic so I don’t really miss the “lemak” rich flavour of coconut milk. I couldn’t resist ordering a bowl of their signature assorted fish balls and stuffed tofu with a bowl of Dry-style Loe Shue Fun. 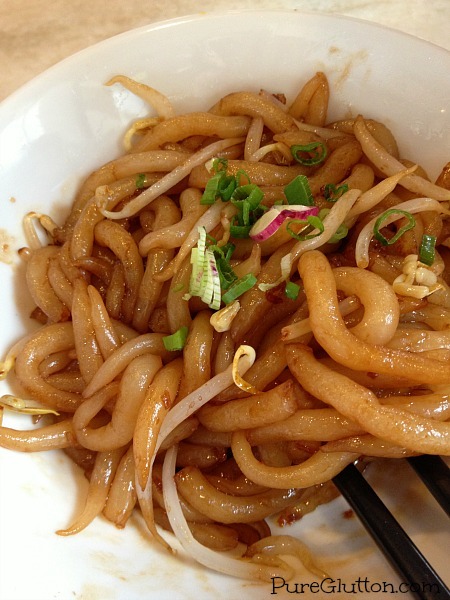 Loe Shue Fun (“rat tails noodles”) is such a Kampar thing. I remember eating this for supper whenever I stayed with my Kampar relatives during the school holidays. 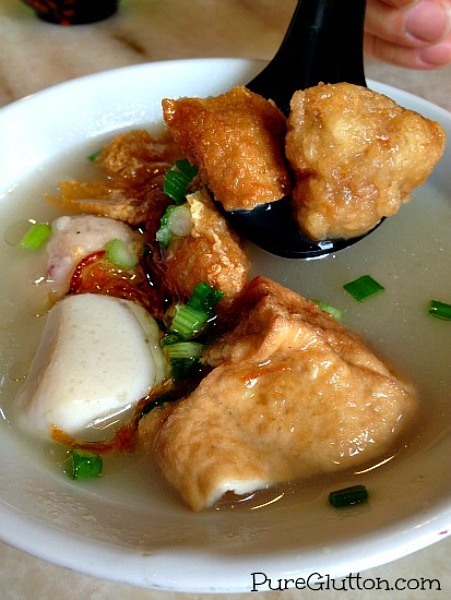 Served in a clear soup, the pieces of fried and fresh fish balls, yong tofu and beancurd skins are delicious. Hogging the main spot in the menu, their famous Prawns & Ribs Noodles is a popular item to order. It is nothing like the usual prawn noodles you get in most places. The soup is darker, thanks to the addition of dark soya sauce in it. There’s also a hint of Chinese herbs in the flavour of the soup which has been boiled with prawns and pork bones. Although it’s called “Prawn & Ribs Noodles”, it’s strange that I could hardly see any sign of prawns. Instead, the huge bowl is filled with tender pork ribs, intestines, beancurd puffs and hard-boiled egg. A tangy spicy sambal is served by the side. 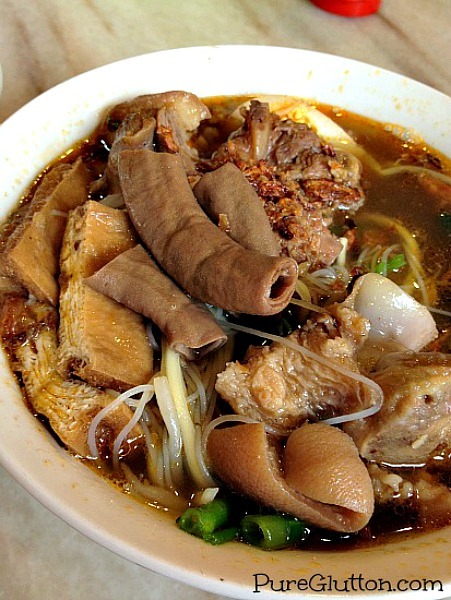 At RM9.90 a bowl, it’s a hearty meal on its own. 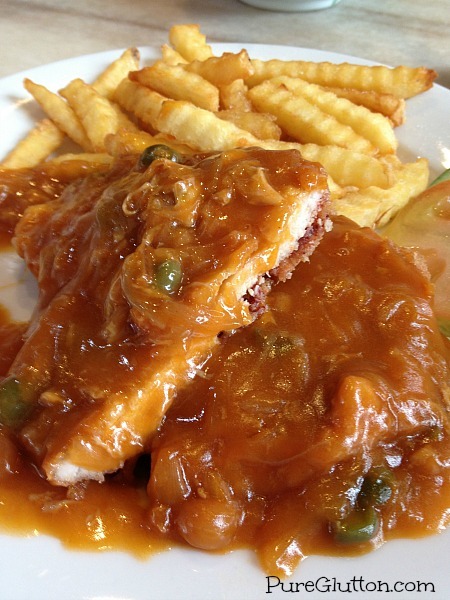 Hainanese Pork Chop is a recent addition to the menu. A decent-sized piece of pork chop is battered, deep-fried and served with a sweet & sour sauce poured over it. The dish comes with a generous portion of French fries as well. I found the sauce to be a bit too thick; otherwise it’s a good item to order if you are looking for a western option. There’s a Chicken Chop version of this too. 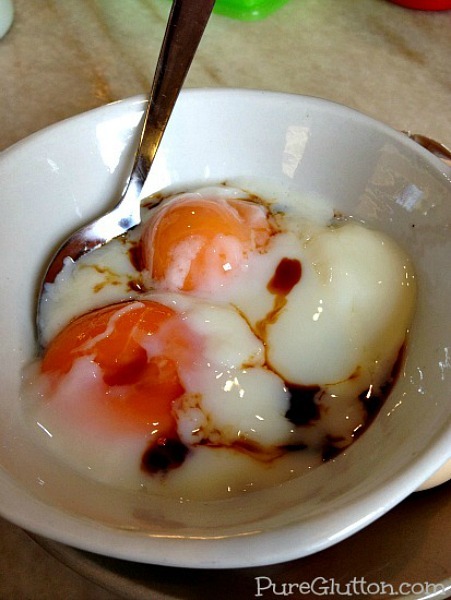 As Kampar Old Town Kopitiam opens at 7.30am, some of the breakfast items not to be missed are their Soft-boiled Omega Eggs and Toasted Bun with Butter & Kaya. The eggs are done perfectly with the bright-orange yolks maintaining a firm shape outside but once mixed with the whites, the semi-soft textures are just excellent. The oblong shaped bun has a crunchy toasted exterior sandwiching a layer of butter and kaya inside. The eggs and bun should be taken with a cup of their thick Kampar coffee – a perfect start to any day! The Kota Kemuning outlet is the family’s second foray into the Klang Valley. Its other outlet is in USJ Subang which started operations in 2012. Oh my!!! 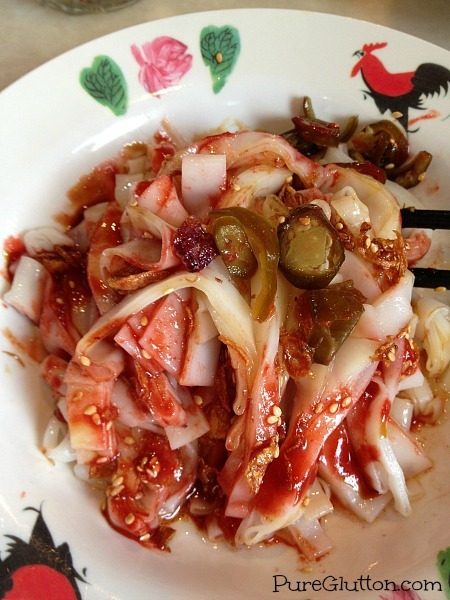 The chee cheong fun! The sweet sauce is the red type. Oh yes, isn’t that great?? That kinda sauce is so hard to come by here! And it tastes authentic! Niced to see got ppl blogging kota kemuning foods. Nice photos too, keep it up! Yes, the teem cheong is RED, hehe! Definitely Ipoh (and Kampar) style! Love it max.